May has been all about perseverance for me. The last few months have been like playing with dry sand on a beach, but never quite reaching the point where you get to the firm layer that is more consistent. Finally the last few days of the month felt like the dry, shifting sands that I’ve been trying to balance on for so long have been making way for something more established. It’s like letting out a big sigh and I’m not sure if it is due to relief, or simply because I’ve been holding my breath for so long just waiting for something else to happen. I’m almost fully recuperated from major surgery in April. I’ve given myself time off from thinking or worrying about anyone else but myself. I have allowed new creative and business ideas to form without rushing to put them into action. By granting myself this precious time I’ve become motivated by the sparks of opportunity. The drive to get up and do something has been missing from my life for considerable time, and it’s certainly welcomed back with open arms. I haven’t actually completed many knitting or crochet projects this month. Prior to surgery I sorted a selection of patterns and yarns into project bags with the intention of always having something to hand during my recovery. It’s a great idea if you have a huge stash and hundreds of patterns in your queue. You just have to hope that your mojo is around to encourage you to pick something up! I did finish a pair of short ankle socks for my dear friend Martha, using my own hand dyed yarn (made at a workshop with the awesome Hannah of HeyJay Hand Dyed Yarns). Martha has been amazing over the last 6 weeks. In fact she’s awesome all of the time, but she took time off work just to keep me company in hospital. She visited every day during the first few weeks of me being home to walk my dog and keep me company. She came to our rescue to look after my dog and help my husband out when I was rushed back to hospital due to sepsis. She’s a good egg, and deserves all the socks! I should also mention Paula, who is patiently waiting for her socks! She deserves another big thank you for being so supportive, and I know she understands that I will get started on them this month. It’s a good job she has small feet! 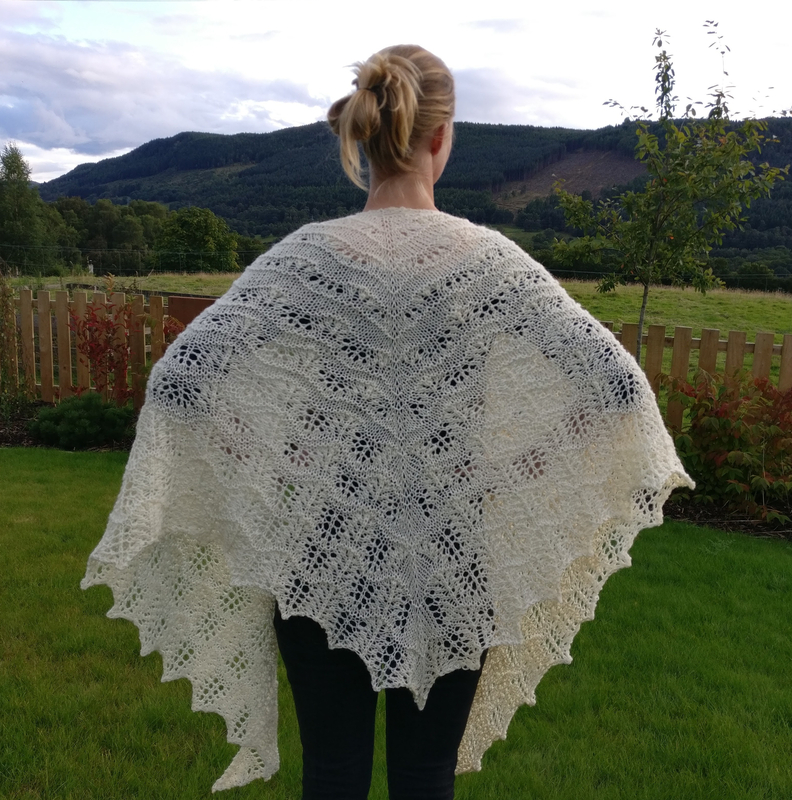 The only other finished project is the Causeway Shawl from the summer edition of the Toft Quarterly magazine. 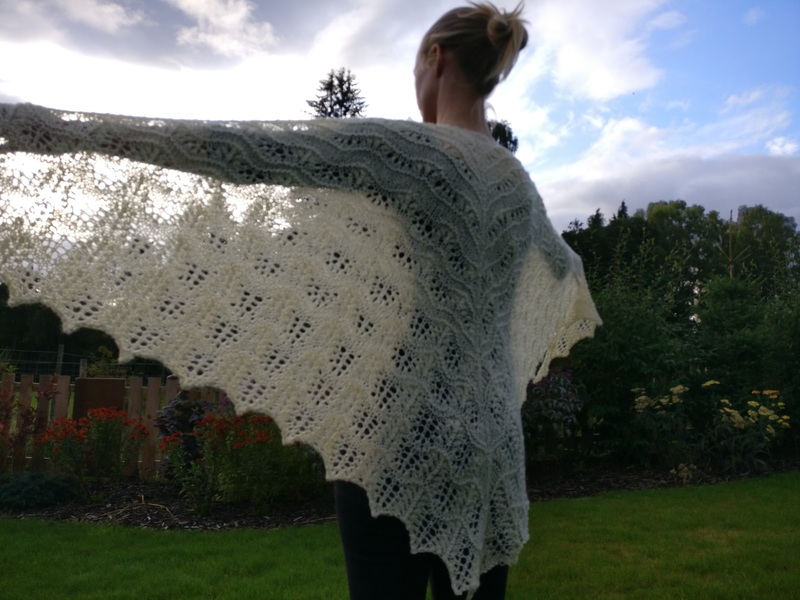 It is a simple crochet triangular shawl which my husband picked out as he loved the colour combination. 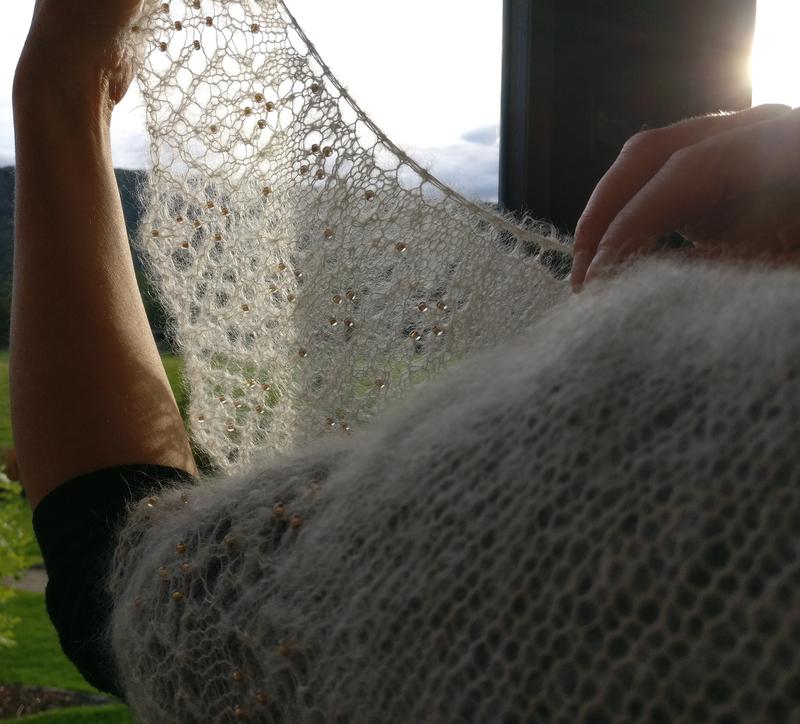 I haven’t crocheted any kind of garment for a couple of years, so my tension is a bit off in places, but a gentle blocking sorted it out. I’ll be taking some photos of it this evening at an event at Toft, and will post about this separately. So, its goodbye May, you wont be missed in most respects! I’m excited about what June has in store, and I’m looking forward to sharing it with you.